Cheapest refrigerator magnets are ruling the roost and everyone seems to get crazy about them. Everyone is in hurry to grab and gift these magnets because they can charm anyone with their demeanor. Photo Magnets – Any unique custom magnet, which exude lots of personalized flavor and freezes your special moments in a lively cocoon can make a good photo magnet. This magnet makes a good gifting choice in any season, and you can always rely on it to overwhelm others and show how much you care for them. Vintage Magnets – There are oodles of choices when it comes to vintage magnets. Any nostalgia inducing symbol can be framed within this magnet. 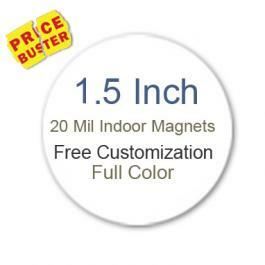 Most of the online magnet development stores offer lot of freebies for customizing the magnets in your style. Smiley Magnets – Any magnet, which enhances your mood and nudges for that elusive smile to appear on lips, can be categorized as a smiley magnet. It is best way of making up with someone or bunch of people, whom you might have annoyed to get something done. Our each day is marked with gamut of emotions such as happiness, sorrow, distraught, helplessness and during such times a pleasantly winking magnet at refrigerator door will definitely ease up situation. Souvenir Magnets – This is one of the cheapest refrigerator magnets of the lot and is often sought by advertisers in tourism sector to promote their services. This magnet may have lowest value investment, but they still wrap lots of sentimental value. Souvenir magnets are retained for long time over refrigerator doors. Love / Hate Magnets – Over the years the magnetic advertising has become popular and every one easily handle with little efforts. Love/hate magnets highlight supporting slogans or opposing slogans. You can get your thoughts printed against any regular shaped magnet such as circle, rectangle, triangle, square, etc. Seasonal Magnets – They are hot and always in news because people gift them even when there is no particular reason to celebrate. These magnets can wrap simple or value added information at ease. Food Magnets – Any magnet which evokes the feeling of food or triggers a taste sense in your mouth makes a good food magnet. You can always amuse others by designing lively magnets with minimum efforts. Food magnets are especially employed by food marketers for promoting their services. Birthday Day Magnets – Occasion/event related magnets are getting popular by day and are usually handed out at the end of celebration. They may wrap simple thanks messages or some specialized birthday messages. Save the Date Magnets – These magnets have replaced the paper invitation cards. The choice of information can be formal or integral depending on personal preferences. Business Cards – Magnetic business cards are the cheapest magnetic promotional tools and are offered by most of the reputed online stores. Business card magnets are very reliable when it comes to introducing business details. Advertisers working in extremely constrained budget conditions can always rely on them to get their business advertised. Simplicity and creativity rules the magnetic advertisement, you can excel in both with minimum efforts. Cheapest refrigerator magnets are decided by factors such as imprinted information, choice of symbols, etc.